U.S. securities laws revolve around two distinctions, one regarding investors and the other classifying investments. Individual investors are either “accredited,” which means that they have at least $1 million in non-home assets or an income greater than $200K (or $300K for a traditionally married couple, and I support the effort to remove the discriminatory bias underlying this); or “unaccredited,” which means everyone else. Accredited investors comprise roughly 3 percent of the population right now. "In response to these deep-structure changes to the rules of investing, new investment platforms are launching, and existing ones are rolling out new public faces." Meanwhile, investments are either registered or unregistered, a distinction that until now has been analogous to public vs. private. Registered investments, such as big-company stocks or bonds, have gone through the expensive “going public” registration process, publish regular financial reports, and trade on the open markets. Unregistered investments, a.k.a. private, more typically come from startups and small businesses. These are offered behind closed doors, and don’t mean having to hire a dedicated compliance officer to keep up with all the required Securities and Exchange Commission filings. The relationship between these two distinctions is that only accredited investors, who are presumed to be more sophisticated and better able to bear loss, may invest in either registered or unregistered offerings. Unaccredited investors, on the other hand, can only buy publicly traded, registered investments, which are presumed to be less risky. The one exception is a “friends and family” provision through which up to 35 unaccredited investors can privately invest in an unregistered offering from someone they already know — but securities attorneys often recommend against this. This two-tier system has certainly barred the vast majority of people from smoke-filled rooms where business decisions are made, but Monday’s regulatory change makes some of the private equity world public by removing the longtime ban that unregistered securities have had on “general solicitation,” as advertisements, open websites, tweets, etc. are called. The new Regulation D Rule 506(c), which was mandated by the JOBS Act of 2012, permits issuers of investments to “solicit potential investors directly, through both physical (such as mailings, newspaper advertisements and billboards) and electronic (such as the Internet, social media, email and television) means.” Only accredited investors may buy these investments; everyone else can just observe as bystanders. Along with its direct effects on the investing landscape, this change will undoubtedly raise public awareness of the distinction between accredited and unaccredited investors. 1. The new laws around general solicitation and crowdfunding are different things, but both come from the JOBS Act. The JOBS Act of 2012 stands out as a rare example of bipartisanship from the historically unproductive 112th Congress. Title II of the legislation becomes effective Monday to lift the ban on general solicitation. Title III, the crowdfunding exemption, modifies securities law even more radically by permitting unaccredited investors to invest limited amounts unregistered securities under certain conditions. The SEC has yet to work out the details for this, but SEC chair Mary Jo White has said that the proposed rules will come out this fall. 2. The 506(c) rules that went live Monday are not the same as the proposed 506(c) rules that the SEC recently sought comment on. On July 10, the SEC took two actions that conspiracy-minded people have interpreted as intentionally confusing. On Monday, it ratified the 506(c) rules that permit general solicitation, and it also proposed additional rules for 506(c) eligibility. Among them, that issuers must notify the SEC 15 days before raising any money, include legal boilerplate in any public mention of their offering, file documents with the SEC for any business plan change or “pivot,” and submit to a one-year ban on any fundraising for any violation. This proposal has encountered overwhelming opposition on the SEC’s open comments page from lawmakers who see it as illegal — from entrepreneurship heavyweights like Fred Wilson, Mitch Kapor, Naval Ravikant, and the Angel Capital Association, who see it as infeasible, unnecessary, and unenforceable, and from hundreds of others. 3. Demo days, pitch events, and the like may constitute general solicitation. Investment-seeking startups, especially in tech, routinely demonstrate their products and discuss their business plans at public events like pitch contests and demo conferences, although they avoid discussing deal specifics. Investors find opportunities at these events, which have been going on around Silicon Valley for decades. Startup lawyers like William Carleton have wondered whether the SEC would consider such practices to be general solicitation; if so, he notes, then 506(c) may finally establish a legal framework and oversight for practices that have long been operating in a gray area. When this question was asked at an SEC meeting last week, it wasn’t entirely clear how familiar securities regulators even were with such events. But they seemed honestly eager to learn more about the typical Silicon Valley/tech industry model of startup financing, while others at the meeting seemed eager for the SEC to study and make a ruling on the question. 4. 506(c) is for startups and angels, not hedge funds. Perhaps betraying an East Coast bias, CNN Money, CNBC, Bloomberg BusinessWeek, the Wall Street Journal, and other media outlets characterized last June’s release of the 506(c) rules primarily as legalizing advertising by hedge funds. But in fact, Title II of the JOBS Act makes no mention of hedge funds, only accredited investors, and the strongest lobbying for the legislation came from the angel investor community. The dynamics of angel investing differ from those of hedge fund investing. Angels often have experience in the fields that the startups they suppport operate in, and they seek personal connections and advisory relationships with those companies, who in turn value their guidance. Hedge funds, in contrast, are pools of capital from multiple individuals that are invested by a professional manager who collects a fee no matter how the investments fare. Hedge fund managers seek financial gain from diverse investments in a more detached manner, with most investors having no personal connection to the companies that they fund. Bain Capital is a familiar example of a company that operates hedge funds. The platforms described below that are taking advantage of 506(c) primarily serve individual angel investors. But the hedge fund industry does have connections to the SEC, and as AngelList COO Kevin Laws told me in conversation, the SEC’s proposed 506(c) rules, which angel investors oppose strongly, are less of a burden for hedge funds and traditional Wall Street brokers, because they are tuned to their existing process of issuing formal Private Placement Memoranda (PPMs). 5. People use the term “crowdfunding” in different ways. “Crowdfunding” is a buzzword that people are using in different ways. Some refer to 506(c) investing as “accredited crowdfunding,” but for others, crowdfunding can only mean funding by the general public. Most people use the term in the “traditional” sense of Kickstarter and other platforms that raise non-investment contributions or pre-orders, but a group called Startup Exemption lobbied to “legalize crowdfunding,” using the term to refer to investing exclusively. 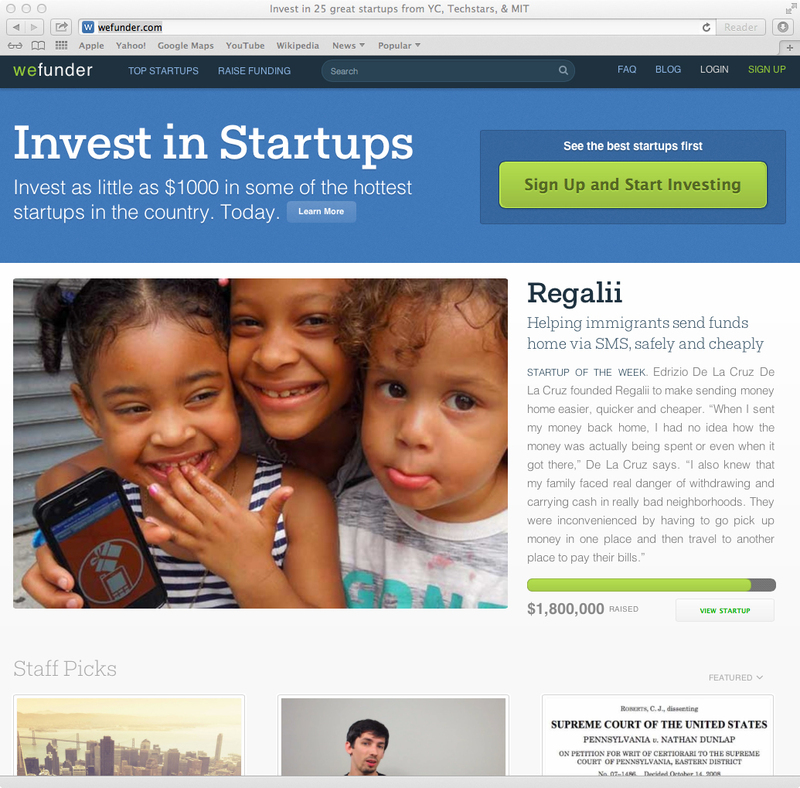 To clear up ambiguity, the founder of the crowdfunding site Return on Change, Sang Lee, argued that we should stop calling any investing crowdfunding, and instead use a term like “crowd investing.” Meanwhile, the research firm massolution includes peer-to-peer lending in their definition of crowdfunding, an inclusion that financial journalist Felix Salmon questions. The take-away is that when someone uses the term “crowdfunding,” you should make sure you understand what they’re referring to. Recent focus on the JOBS Act overlooks some parallel investing news that probably is more relevant to most new entrepreneurs, and certainly more relevant to the general public: the emergence of new intra-state investment laws and online platforms for direct public offerings (DPOs) that are open to both accredited and non-accredited investors. DPOs resemble “going public” stock sales, but within a single state, where the state government rather than the SEC governs the sale. Each state has its own “blue sky laws” governing investment sales within that state (the issuer and all investors must reside there), which are named for Kansas, which passed the first securities laws in 1911. Blue sky laws differ from state to state, but they all make the same accredited/unaccredited distinction as the federal law. Nevertheless, they also include provisions for selling investments openly to the general public, through a mechanism that’s less expensive and time-consuming than taking a company public under federal law. 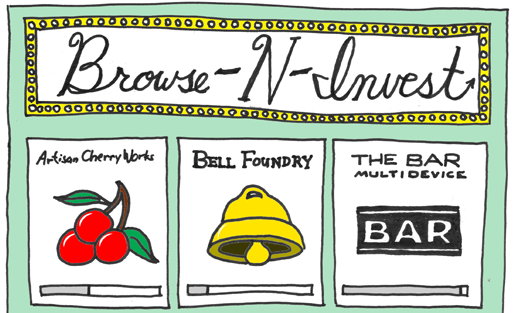 Despite a few prominent examples like Ben & Jerry’s (stock sold to Vermont residents in 1984) and Annie’s Homegrown (California, 1995), DPOs have not been common, but they are gaining popularity for local businesses that understand that they enable investment crowdfunding under current law; no waiting for JOBS Act Title III. Organizations like the American Sustainable Business Council argue that locally oriented crowdfunding is the most trustworthy, so relying on in-state investment may be an advantage. Earlier this month, the Oakland, Calif.-based securities law firm Cutting Edge Capital, which has handled DPOs for local-oriented businesses in numerous states, launched its Cutting Edge X platform, which enables easy, online investing in DPOs for the first time. William Carleton and others argue that the JOBS Act Title III is fundamentally flawed, particularly around issuer liability protection (or lack thereof), and that it probably won’t be useful to many small businesses no matter how the SEC implements it. Such doubts have sparked a healthy movement of states considering and passing new intra-state crowdfunding exemptions based on the JOBS Act provision, but streamlined and made more workable to make DPOs far easier. Kansas started the ball rolling before the JOBS Act, following its proud history, with the Invest Kansas Exemption in 2011. Since the JOBS Act, Georgia has legalized the Invest Georgia Exemption, and similar bills have been introduced into the legislatures of North Carolina, Washington state, and Wisconsin. In Georgia, two in-state crowd investing platforms, SparkMarket and SterlingFunder, have launched to take advantage of the Invest Georgia Exemption. In response to these deep-structure changes to the rules of investing, new investment platforms are launching, and existing ones are rolling out new public faces. Meanwhile, more companies are launching or extending new services to support them. These include licensed broker-dealers, with whom non broker-dealer platforms must partner with in order to legally sell securities, and companies that offer accredited investor status verification services, like SecondMarket and CrowdBouncer. Without further ado, here are some investment platforms that have opened up Monday, plus another one that launched earlier this month. They curate and investigate the investments that they list, to ensure that they’re trustworthy and of good quality. As the 1990s adage goes, “content is king.” And as investment hosting infrastructure becomes increasingly commoditized, we can expect the most successful platforms to be the ones that list the best investments. All of these platforms are on the forefront of economic vitality, job creation, and innovation, and are showing things that the public has never seen before. So if you need investors for your promising new business venture, you know where to go. After its launch in 2010, AngelList quickly became the alpha platform for angel investors to review hot new tech company deals. AngelList started as a simple introduction and discussion space for startups and investors, with actual transactions taking place offline. Last year, AngelList partnered with registered broker-dealer SecondMarket to enable its users to make investment transactions through AngelList directly. Over 1,300 startups have been fully or partly financed through AngelList, including Uber, Leap Motion, DuckDuckGo, Outbox, and Philz Coffee, for an estimated total of $200 million raised to date. Last month, AngelList debuted a “syndicate” mechanism that helps its best investors quickly form investment groups around new startups that they like. Several startups, including persistent desktop telepresence service Sqwiggle, met their funding goals within days this way. Monday, AngelList launched Public Fundraising, which gives any of its startups the option to appear on the public front of the site, with no sign-in required to see their listing. More than 1,000 startups and accelerators on AngelList will be participating in Public Fundraising, including SoundFocus and Shyp. AngelList charges no fees to either startups or their investors for the Public Fundraising service, with no other hidden costs, and pays for any needed accredited status verifications, which are handled through SecondMarket. In return, AngelList takes a “carry” on deals that become profitable, 5% on syndicated deals or 10% where there’s no lead investor and they have to step in as manager. Most deals yield no profit, so the carry is usually $0– and when they do pay out, it’s far in the future. A slide deck with more info from AngelList is here. The company has been operating in undeclared beta as an accredited-only investment portal. By publicly showing their wares Monday, through the 506(c) exemption, they take another step towards their ultimate goal of facilitating intelligent public investing in good startups. “Accredited crowdfunding” with general solicitation is good practice for true crowd investing, when it becomes legal nationwide in the future. Wefunder usually pools its investors together into a “Wefund,” which is an LLC created with the sole purpose of containing many small investors as a single entity. This is done to avoid scaring off potential follow-on investors with complex and time-consuming capitalization responsibilities. (AngelList syndicates are also created as LLCs.) Current listing fees for accepted Wefunder startups are $100 plus $25 per investor, and Wefunder takes a 20% carry for deals that turn profitable, which is the standard rate for the venture capital (VC) industry. CircleUp is a 2-year-old investing platform focused on growing consumer products companies, typically with $1-5 million in annual revenues. By focusing on consumer products rather than more typical technology startups, the company avoids competition. As CircleUp CEO Ryan Caldbeck told me, consumer products companies represent over 20% of the U.S. economy, but they only receive 4% of the country’s angel funding and 5% of the venture capital. CircleUp makes this market more efficient. It takes an average of about one year for consumer products companies to raise a round of capital, but on CircleUp the average is 61 days. CircleUp accepts just 2% of the applications that it receives from companies seeking listing, and it’s now a registered broker-dealer, so it supports investment transactions directly on its own site. For investor status verification, CircleUp relies on SecondMarket. Both during and after funding, CircleUp takes an active role in its accepted companies’ success. For example, it runs “incubator days” to bring its startups together with senior executives from consumer product giants like General Mills and Proctor & Gamble. 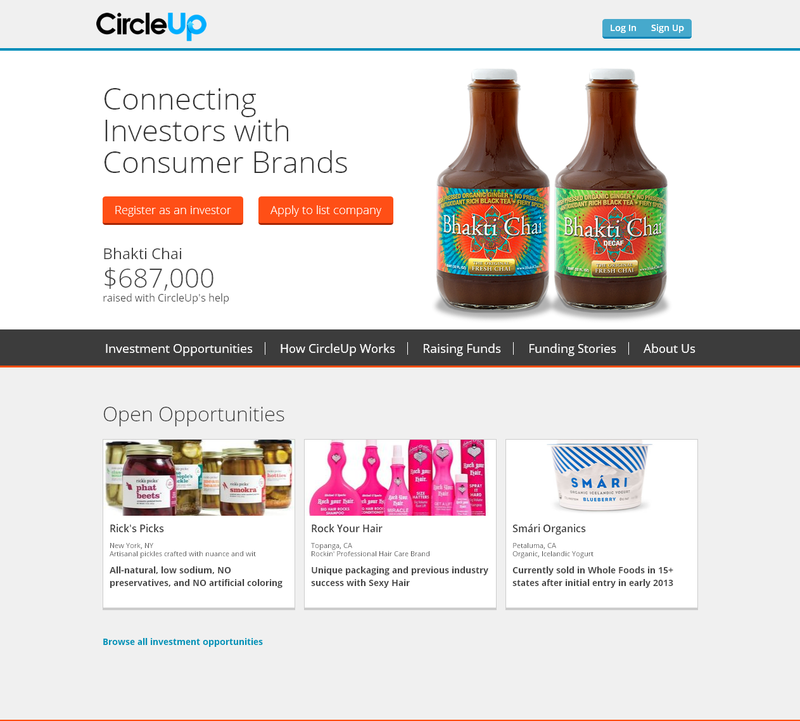 For 506(c), CircleUp has undergone a redesign. As of Monday, anyone can browse and search its listings, each of which has its own page with an easy permalink under circleup.com. Most of the companies already have devoted customers and thousands of Facebook fans, and so CircleUp now gives the accredited ones a way to get more involved. Caldbeck notes that consumer product companies in particular lend themselves to public investing; a cloud computing startup is abstract and hard to grasp, but a favorite granola bar company is something that most ordinary investors will find more compelling. The Cutting Edge X platform from Cutting Edge Capital, which launched on September 2, gives an easy, crowdfunding-style interface to investing in DPOs, which are the only legal means for true crowd investing that unaccredited investors can participate in. Anyone, accredited or unaccredited, can invest in the offerings listed on Cutting Edge X (CEX). And any entrepreneur who’s already done a DPO can apply for a listing on the curated site. If you need to file for a new DPO, Cutting Edge Capital can typically handle the process for $25,000. The CEX platform doesn’t support the online document signing and transaction processing required for selling the securities itself; instead, Cutting Edge Capital will set up this functionality on a dedicated fundraising page on the client’s own website. A recent example is their DPO for People’s Community Market, a community-owned market planned for the “food desert” of West Oakland, where no grocery chain has wanted to open a branch. 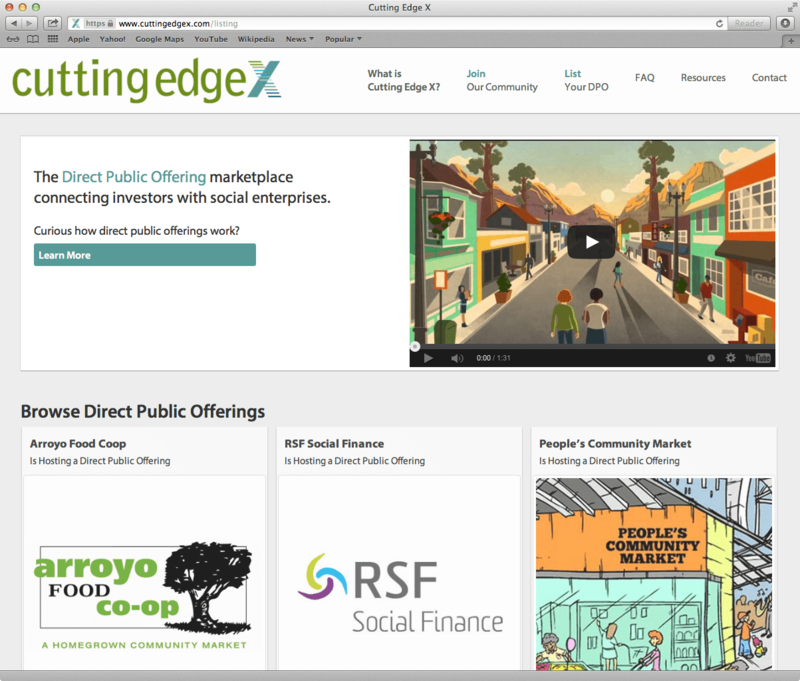 Cutting Edge Capital filed a DPO for People’s Community Market to sell 3% loans with store credit to the local community, via easy online investing, and the offering has so far surpassed 80% of its $1 million goal. Cutting Edge Capital has also handled recent DPOs for Farm Fresh To You (Calif.), Berret-Koehler Publishers (Calif.), Quimper Mercantile (Wash.), and Real Pickles (Mass.). Disclosure: I am an investor in Wefunder and Cutting Edge Capital. This article has been updated to correct AngelList’s Public Fundraising examples, update the Wefunder screenshot, enlarge all screenshots, and tweak the wording to clarify that the new Kansas and Georgia exemptions facilitate DPOs. Paul, fantastic article. As you mentioned, there are going to be many companies popping up to offer support to new investment platforms, especially when it comes to investor accreditation. I wanted to bring your attention to Crowdentials, a company that offers a suite of automated regulatory compliance solutions, including the CAI (Certified Accredited Investor) Program, which allows issuers to be sure that those investors they are offering equity are accredited. Where we differ from other similar services is that we assure an investor’s accreditation without the use of sensitive personal financial documents, giving the investor the ease of mind that their identity and personal financial information are safe. Investor Accreditation is seen as one of the biggest hurdles in the newly evolving private equity market, and Crowdentials aims to lower that hurdle considerably in order to ease the process of accrediting investors.